Before hope*writers, I had written a short children’s book and it sat in a box year after year for more than a decade. I read it many times over those years, envisioning how the words and illustrations would look on each page. Being a speech-language pathologist and working with small children for 20 years, I thought about how a simple little story might help preschoolers and children with special needs learn about shapes and colors and even sequencing and rhyming. Having it published and come to life was simply a dream. As I drove down the road listening, I could not believe it. I was a speech-language pathologist, my job was helping others communicate, much like a sign language interpreter. I also was considering leaving my current profession and also felt a calling to write. Additionally, she referred to the book, Essentialism by Greg McKeown which I was currently reading. I thought maybe God is really trying to tell me something. It was defintely a turning point. From there, I followed a garden path and ended up finding hope*writers, co-founded by none other than Emily P. Freeman! This amazing group has been a foundation for my growth as a writer. It has led me to a family of writers who are not just willing, but excited to guide me. Since becoming a member I have gained a tremendous amount of knowledge about writing and also the much needed confidence to continue writing. Thanks from my heart, hope*writers! 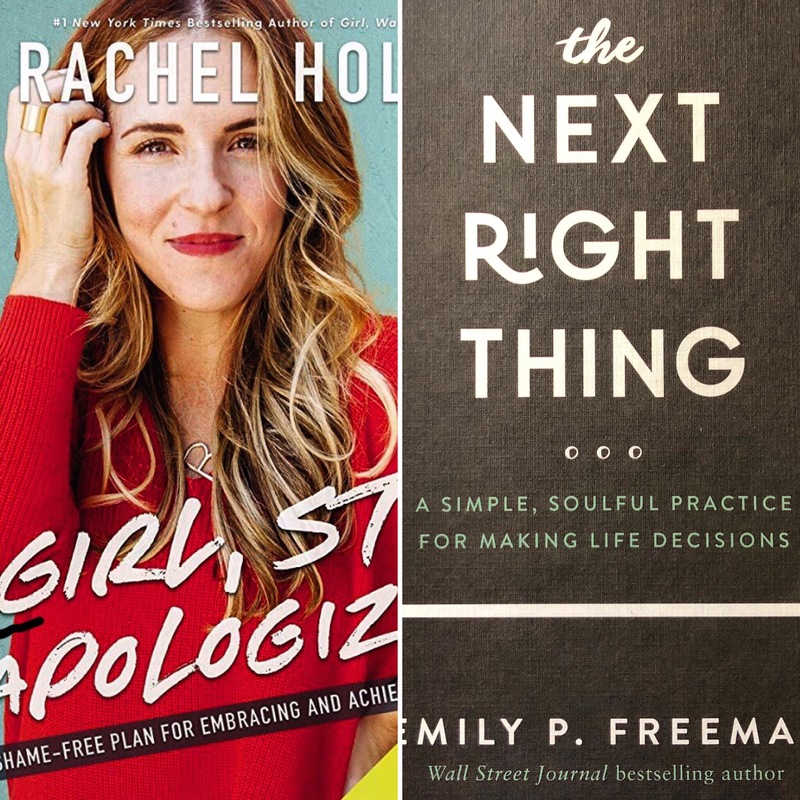 Then enter, Rachel Hollis 2.0! Rachel’s first book, Girl, Wash Your Face, really got me thinking about where I was and where I wanted to go. Her second book, Girl, Stop Apologizing, gave me a plan. Where Emily is the like pink cotton candy, holding your hand and encouraging you with her warm, soft voice, Rachel is like firey red hots, all up in your face, kicking you in the pants, encouraging you to leave your pity party, get up and go after what you want. These ladies have totally different styles and I need them both. I feel like they are little angels sent from Heaven to guide me. Emily in pink ballet slippers and Rachel in combat boots! So Emily and Rachel…..I’m following your words of wisdom. I made a decision to make some big changes in my life. Emily, I’m not going to let fear push me around, I’m going to “do the next right thing in love.” Rachel, I’m saying out loud that I’m going to publish a children’s book. (Eeek, that was so scary!) Thank you ladies, for giving me the tools to make a hard decision and encouraging me to dig deep and not apologize for my dreams. Thank you for helping me realize what those dreams are. Thank you for sharing examples from your own lives to help me better mine. And as for that little story that I threw away, I have read it so many times I have most of it memorized and I can start to fill in the missing pieces. Who knows? The second version might even be better! Just wanted to let you know that Be Well Heart and Soul participates in the Amazon Services LLC Associates Program. When you click on a link and make a purchase it allows me to earn a little commission without any cost to the reader.